The Logical Reasoning is a basic assessment of the candidate's ability to think consistently and to arrive at the correct conclusions as a result of this thinking. The main purpose of the test is to assess the logical thinking in dealing with the problems and situations encountered during his work. In addition, the candidate will be examined in basic mathematics, which is an important part of the evaluation test. The test is a type of psychometric test that helps in screening candidates in their recruitment process. In fact, the test can be defined as a tool that measures the mental ability and logical reasoning rather than the candidate's verbal abilities and skills. JobTestPrep is here to help you prepare. Our logical reasoning PrepPack™ includes practice tests for the various types of logical reasoning assessments (whether non-verbal or verbal) and covers the most common topics you would find on the actual tests. It also includes detailed answer explanations, a study guide, and helpful score reports. Start preparing with our materials today to ensure your success on any type of logical reasoning test. Logical reasoning tests (in the sense of employers' online assessments) usually consist of abstract, diagrammatic or inductive reasoning tests. Employers often use these tests as part of their online selection process. Logical reasoning tests measures your ability to attend to detail, evaluate information, and make judgements or decisions. These tests are usually described as non verbal reasoning tests, since they do not present you with verbal or numerical information but instead with shape sequences and the logical patterns that they represent. However, it's important to note that the term "logical reasoning" is also used to describe verbal logical reasoning tests, which assess the candidates' ability to read and understand complicated texts and, most importantly, to utilize critical thinking skills to draw conclusions and recognize important facts. The Logical reasoning test can be somewhat challenging, especially if you have never taken such tests before. Our comprehensive PrepPack™ will help you familiarize yourself with the logical reasoning test format, its questions, as well as the appropriate responses in order to ace the test and surpass the other candidates. Who Uses Logical Reasoning Tests? Listed below are some of the most popular logical reasoning assessment tests used by employers today. Our Logical Reasoning PrepPack™ includes comprehensive preparation for other similar assessments and covers the most common logical reasoning topics found in the pre-employment tests' world. 1. Choose the image that completes the pattern. Answer Explanation: Each square contains three shapes. The black circle is the only shape that constantly appears. It “travels” along the column, up and down, one step at a time. The other shapes appear in two consecutive squares and then do not appear in the next square. The shape that remains in the frame (in regards to the last step from the left) maintains its relative position to the other shape (not the circle). 2. If there are no dancers that aren’t slim and no singers that aren’t dancers, then which statements are always true? There is not one slim person that isn't a dancer. Anybody slim is also a singer. 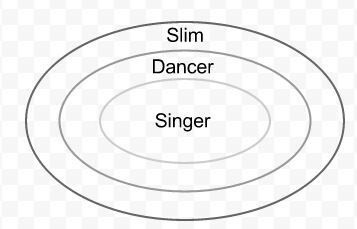 Answer: The correct answer is B, "All singers are slim." Answer Explanation: The tricky part here is that the question is phrased negatively. This means that you first need to identify the nature of each group, and then establish the relationship between the groups. If you draw a diagram (as in the example above), the relationship between the groups becomes clearer. The only true statement is that all singers are slim. 3. Dan is Joshua's son and Guy's brother. Margaret is Guy's mother and Judy's daughter. Which of the statements below is definitely true? Answer: The correct answer is D, "None of the above." Answer Explanation: Dan and Guy are siblings. However, you do not know if they are full siblings or half brothers. Margaret, who is Guy's mother, might not be Dan's mother, and Joshua, who is Dan's father, might not be Guy's father. Therefore, the answer is "None of the above." 4. The following is data supplied by the cabbage growers union report for 2007: 80% of cabbages collected were heavy (over 0.5 kg), 10% of cabbages were green, 60% were red, and 50% were big (having a diameter of over 10 cm). Which of the following statements must be false? All red cabbages weren’t big. 30% of red cabbages were big. There were no cabbages that were both green and big. Half of the cabbages were small. Answer: The correct answer is A, "All red cabbages weren't big." You must check the authenticity of each statement. All red cabbages weren’t big: You know that 60% of cabbages picked were red and only 50% were big. Therefore, there is an overlap (60% + 50% = 110% > 100%). The statement must be false, so you can assume that this is the correct answer. 30% of red cabbages were big: You know that 60% of cabbages were red and 50% were big, so there must be an overlap of at least 10% (60% + 50% = 110% > 100%). However, you don’t know the extent of the overlap. This statement may be true, but you don’t know for sure. Remember, the question asks you which statement must be false. There were no cabbages that were both green and big: You know that 10% of the cabbages were green and 50% were big, so there may not be an overlap between the two (10% + 50% = 60% < 100%). This statement can be ruled out, as it may or may not be false. You're only looking for a statement that must be false. Half of the cabbages were small. You know that 50% (i.e. one half) of the cabbages are big, so the other half may be small. This would make this statement true. And remember, you're looking for a false statement.